It’s a sad fact of life but some people don’t like cats. Even worse, some people are cruel and mean to cats. 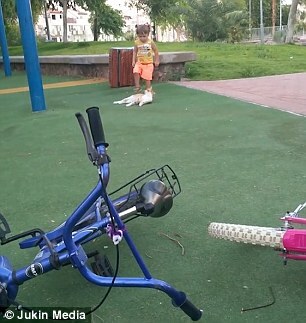 In Israel, a little girl came upon a cat in a park. The girl proceeded to kick the cat, but when that didn’t get the cat to move, the girl stomped on the cat’s tail. The cat immediately leaped to its feet and chased the little girl, who ran over a concrete wall to escape it. Unfortunately for the girl, she tripped over the wall and landed face first on the ground while the cat stood nearby. So the lesson is simple. Don’t be cruel to anyone, especially a cat. Eventually you’ll get what you deserve and that might not be what you want for yourself in the long run. To read more about the girl who stepped on a cat’s tail, click here.